There are bad, distracting, “zany” sound effects. They are a terrible choice. But except for a few scenes, they’re easy to ignore. Similarly: slapstick. The movie could have done with about 50% less slapstick. There are a few aspects that would be annoying if we had certain meta-knowledge. Who is playing this or that small role, for example. But we didn’t know, so it was just a small, somewhat amusing role. This movie is not exactly kind to its women. The female characters are almost entirely eye candy or shrewish or both. It could have been much worse, and it is possible to look past the jokes to see that there is some character under there. The filmmakers don’t get a pass, but I think the movie’s heart is in the right place often enough that I’ll partially forgive some dude-centric density in the writing and cinematography. Now, all that said: we loved this. We were SHOCKED, but we really enjoyed watching this movie. For one thing, it starts in the distant past, when Nicholas is born. And he’s perfect. And if your sibling is perfect, it’s really hard to live with that. Even if he becomes an actual saint and makes himself and his immediate family immortal (apparently that’s how it works - just go with it). You’re always going to struggle with that, no matter how much you love each other. And that relationship is what the movie played just right all the way through. The strongest themes here are sibling and family relationships and the troubles of children, specifically the kinds of hurt that affect kids out of all proportion, and how ‘bad’ kids often are just reacting to their circumstances. Fred is a schmuck and a bit of a loser, but he tries when the chips are down and he cares about others, he just needs to learn better ways to show it. 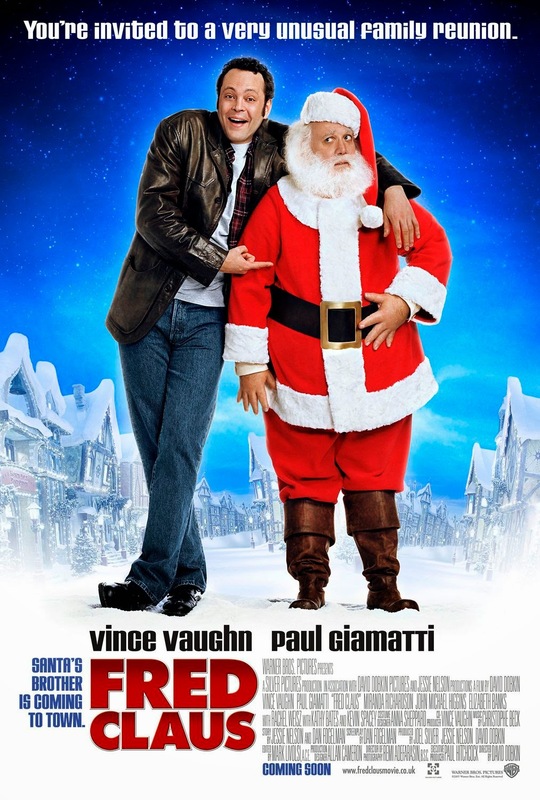 Paul Giamatti's Santa is long-suffering and completely caring in a perfect balance. The head elf is played by John Michael Higgins, who plays straight man in a crazy world with pathos and certitude. There’s a villain: an efficiency expert from an unnamed agency who apparently has power over Santa. (It’s not explained, but I like the idea that God hires bureaucratic paper-pushers in dark suits.) He’s played by Kevin Spacey. He’s absolutely delightful. Sure, it’s disjointed and unbalanced here and there, but what it does well is sweet, wonderful and hilarious. The use of music is spot on: they used a lot of songs I love in interesting ways. The climax with the villain is perfect. If you have a soft spot for stories about Santa or stories about brothers, give this one a chance. We enjoyed this so much that despite its flaws we’re calling it Highly Recommended. We might be the only ones who liked this movie, but goddamn did we like it.